​While she holds a degree in international business, Nicole has always had a creative career in mind for herself. Highly influenced by her grandfather, a ceramicist by trade and a logger, carpenter and baker in his spare-time, and her older sister, a master wood carver, "making things" became part of her daily life early on. ​She remembers seemingly endless German winter months as a child sitting side by side with her mother knitting, sewing, crocheting and embroidering. 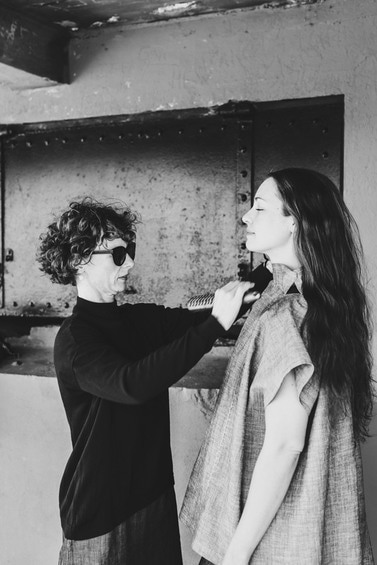 Once settled in California, about a decade ago, she deepened that knowledge by studying fashion design and pattern making in San Francisco and attending various residencies at the fashion house Carla Fernández in Mexico City. A native of the Black Forest region of Germany, Nicole now lives and works in Napa and shares a studio space with her husband and fine artist Mikey Kelly. ​Mikey holds a MFA in ceramics from Cranbrook Academy of Arts and has his own fine art practice, creating paintings, drawings and sculptures based on a repetitious network of hand-drawn lines. His work is in the collections of Cranbrook Museum of Art, University of Hawaii at Hilo, Frankel Foundation for Art an din the collection of Burt Aaron, Founding Trustee of of MOCA Detroit. With his expansive experience working with artists and designers like John-Paul Philippe, Klein Reid and Agrosy Designs in New York City and in retail/commercial design and displays for Barneys, Bergdorf Goodman, Urban Outfitters, The Ace Hotel and The Standard Hotel, Mikey is an expert in working with new materials and streamlining processes. Since the first day of YOLOTLI, Mikey has played a big role in the manufacturing of YOLOTLI's exhibition spaces. Since 2017 he has taken on the role of the brand's master sandal maker. 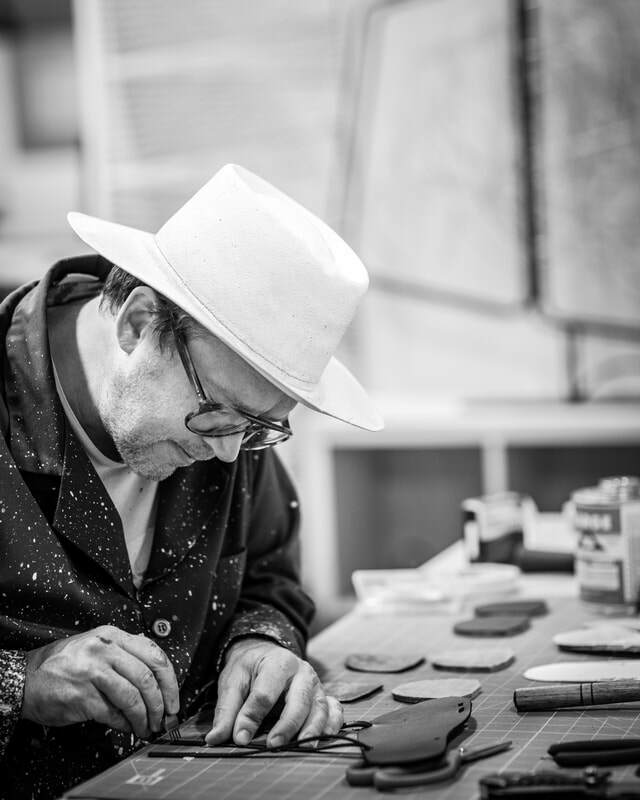 He works closely with Nicole to develop and hand make the new sandal designs and makes sure that only highest quality materials and processes find their way into our original Napa Valley leather sandals.